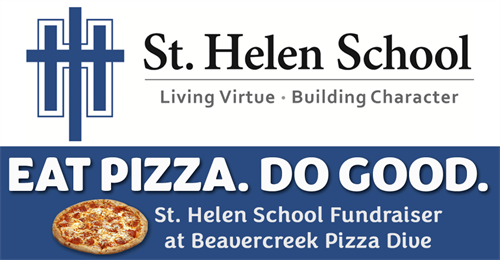 St. Helen School Fundraiser February 25 – 28 at Beavercreek Pizza Dive. Show your support for St. Helen School PTO and help them raise some dough when you eat pizza February 25 – 28 at Beavercreek Pizza Dive. All proceeds will go to the PTO to enhance and enrich the school. Come to the Fundraiser Kick-Off at the All-You-Can-Eat Buffet on Monday, February 25 from 4:30 to 8:00. St. Helen School PTO volunteers will be your celebrity servers at the Fundraiser Kick-Off. $1 from every Adult Buffet purchase goes to the fundraiser when you bring the flyer. Eat pizza Tuesday, February 26 – Thursday, February 28 and 20% of your purchasegoes to the fundraiser when you bring the flyer. Come out, come hungry, come eat some pizza, and come raise some dough for the St. Helen School PTO.